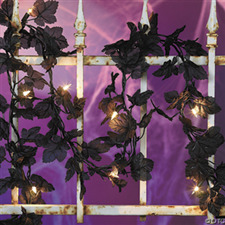 Halloween Black Leaves Light Set. Decorate your lair with this string of black fabric leaves! Imagine this black ivy creeping across a mantle, climbing over a door, wrapping around a railing or circling a group of innocent jack-o’-lanterns. This decorating accessory can really add to your holiday home party décor! Set a scary scene on Halloween with these 10 lights on a vine of glittery black leaves. 8 ft. Light sets interconnect. UL listed. For indoor use only.